What can Harmful Environmental Chemicals Do to Thyroid Function and Body Weight? Several factors are known to influence thyroid function and health. Thyroid disorders tend to run in families, low iodine intake can depress thyroid activity, and exposure to radiation harms the thyroid. However in addition to these established risk factors ongoing research reveals toxic environmental chemicals pose a serious threat to your thyroid function and health. Could daily exposure to harmful environmental chemicals have negative effects on your thyroid? Like it or not widespread global industrialisation over the last few decades has flooded the planet with a cocktail of dangerous environmental chemicals. Contamination is widespread, and poses a serious threat to the quality of the food we eat, the water we drink and the air we breathe. Environmental health experts warn exposure to even very small concentrations or a complex mixture can interfere with reproduction, immune health and nervous system function. Over time exposure to risky environmental chemicals can lead to a diverse range of health problems such as hypothyroidism, chemical sensitivities, nervous system disorders, even some cancers. The thyroid is extremely vulnerable to the effects of hazardous environmental chemicals. It should therefore come as little surprise that thyroid problems are escalating as we become increasingly exposed to environmental pollution. The incidence of thyroid disease, most notably thyroid cancer and thyroid autoimmune disease is increasing substantially. There is a wide array of environmental chemicals that harm thyroid health. 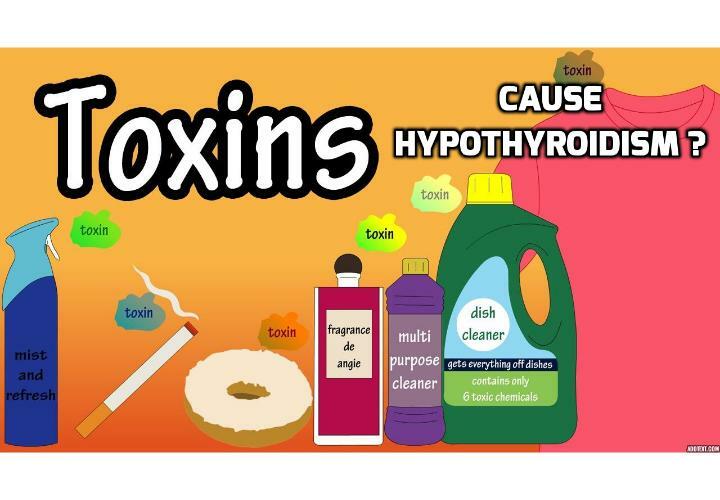 Termed ‘thyroid-disrupting chemicals’ these pollutants have the ability to change the way thyroid hormones act in the body. They can also directly attack the thyroid, block uptake of iodine in the thyroid, trigger thyroid antibody production leading to an autoimmune thyroid disorder and increase the risk for serious thyroid conditions. Does Daily Exposure to Environmental Chemicals Cause Weight Gain, and Even Obesity? Emerging research also reveals that everyday exposure to toxins can contribute to weight gain. Termed ‘obesogens’, these potent environmental chemicals have the potential to cause weight gain, even obesity. Dietary, pharmaceutical, and industrial compounds alter a range of processes within the body which in turn can increase the risk of being overweight and obese. According to a new study published in the Journal of the American Medical Association even children are at risk. Researchers found children exposed to high levels of bisphenol A (BPA) are five times more likely to be obese than children with low levels. BPA mimics oestrogen, the main female hormone. This means this compound is capable of having effects similar to oestrogen in the body. In excess oestrogen activity is harmful to both the male and female body. Exposure to BPA is widespread as this toxic chemical is used in the lining of aluminium cans, baby bottles, printed store receipts, plastic containers and medical devices. Sure an unhealthy diet and a sedentary lifestyle are certainly risk factors for obesity but studies such as this add to the evidence of a possible link between environmental chemicals and spiralling obesity rates. The following list of the most hazardous thyroid disrupting chemicals is a little daunting but gives you an idea of what we are up against. These chemicals are all around us so we need to look at minimising our exposure as much as possible for proper thyroid function. halogens which include fluoride, chlorine, perchlorate and bromide. Halogens compete for the same receptor sites as iodine with excessive intake crowding out optimal iodine activity. Are Iodine Supplements For Thyroid Health Really Safe? Is It Safe To Take Iodine When You Have Hashimotos Disease? Why these Top 5 Thyroid Blood Tests are Essential? What Causes High Reverse T3 (RT3) – a Major Driver of an Underactive Thyroid? Why Testing for Viral Infections Can Solve Your Thyroid Disorder? Louise O’ Connor, the author of The Natural Thyroid Diet –The 4-Week Plan to Living Well, Living Vibrantly, who is a specialist in Thyroid Health. She is a highly regarded Australian Naturopath and founder of Wellnesswork. Très joli 360 frontal https://www.youtube.com/watch?v=ny8rUpI_98I droit, qualité superbe, lettre agile, que du !! Previous PostPrevious Why Testing for Viral Infections Can Solve Your Thyroid Disorder? Next PostNext Why a Gluten Free Diet can Help Thyroid Health?